Some children don’t have aunties. And they may not have parents, either. Or their parents have proven themselves incapable of providing care. So, on Christmas Eve, when other children are excitedly waiting for Santa’s arrival in the comfort of their homes, these kids without families are living in a foster youth facility. For those of us who embrace our opportunity to support and nurture our nieces and nephews, it can be hard to conceive how this happens. Lucky for me, most Christmases are spent with my nieces and nephew. But one year, when my oldest niece was a toddler, she was with her father’s family in another state, and I was with my parents. None of us were following the advice of that famous lyric, “you better not pout.” Instead, we were all hanging our heads because the child who brought smiles to our faces was not with us. There was little joy and definitely no fa-la-la being shared as the holiday neared. We moped. My father is the CEO of Orangewood Children’s Foundation, an organization dedicated to providing a variety of services to foster children and the young adults who grew up in the foster care system. Knowing we needed to do something that would take our mind off of what we were missing, my dad suggested we spend Christmas Eve helping the visiting Santa Claus pass out gifts to children at the Orangewood home, a temporary residential facility for kids in transition. While looking into the faces of babies, teens, and all ages in between as Santa visited the dorms, I received a gift that night, too. I was reminded of what I had, those who are in need, and the personal responsibility each of us carries to help those who are less fortunate. This is, of course, one of the great benefits of volunteerism: by stepping away from our personal situation and supporting others, we emerge from the activity positively transformed ourselves. Charity is a learned behavior, and as aunties, we can support the betterment of society not only through our own efforts but also by teaching our nieces and nephews about helping others. This time of year provides many opportunities for giving, especially for children, which makes the activities all the more relevant when educating young ones. Below are just a few ideas to get started. 1. Collect neighborhood donations for local shelters. To instill both a sense of community and charity, you can organize a simple neighborhood donation drive. 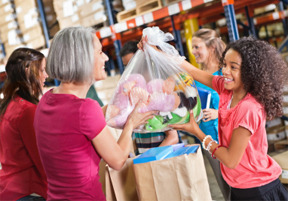 Work with nieces and nephews to identify a local shelter that you want to support and find out what items they need. Then walk door to door, having a niece or nephew make the request of neighbors. The activity will build their skills in presentation, confidence, and leadership while also exhibiting the charity of a neighborhood. 2. Get involved with Toys for Tots or Operation Santa Claus. Two organizations that provide gifts to needy children during the holiday season are Toys for Tots and the U.S. Postal Service’s Letters to Santa program. The activities of these organizations vary by community, so check the websites to learn how to get involved in your area. In most cases, you will need to buy a toy that a needy child has requested and take it to a local donation center. Involving nieces and nephews in buying gifts for other children supports the development of empathy and gratitude. 3. Clean the closet of unused toys. The unused toys in their closets could be treasures for other children on Christmas morning. Work with nieces and nephews to clear out the unused toys and make a donation to Goodwill or Salvation Army Family Stores. This teaches charity and endears you to the family. After all, what parent isn’t happy to see their child cleaning out the closet? 4. Introduce them to DoSomething.Org or another kid focused charity group. DoSomething.Org is a non-profit that leverages the energy of teens to create positive impact through a series of campaigns that don’t require “money, an adult, or a car.” Examples of ongoing campaigns include the collection of denim jeans for homeless shelters and Pics for Pets, taking pictures of shelter animals and sharing them to encourage adoption. Visit the robust website to get your teenage nieces and nephews signed up with the organization. While on the site, you can find other great ideas for involving the kids in charity and volunteer projects. Have you already conducted charity projects with the children in your life? Do you have other ideas for volunteering with nieces and nephews? We’d love to hear from you so please comment if you have other ways for educating kids to be more charitable.